This has been in the pipeline for a few months now, the first public Big CoC public weekend at the WHC. 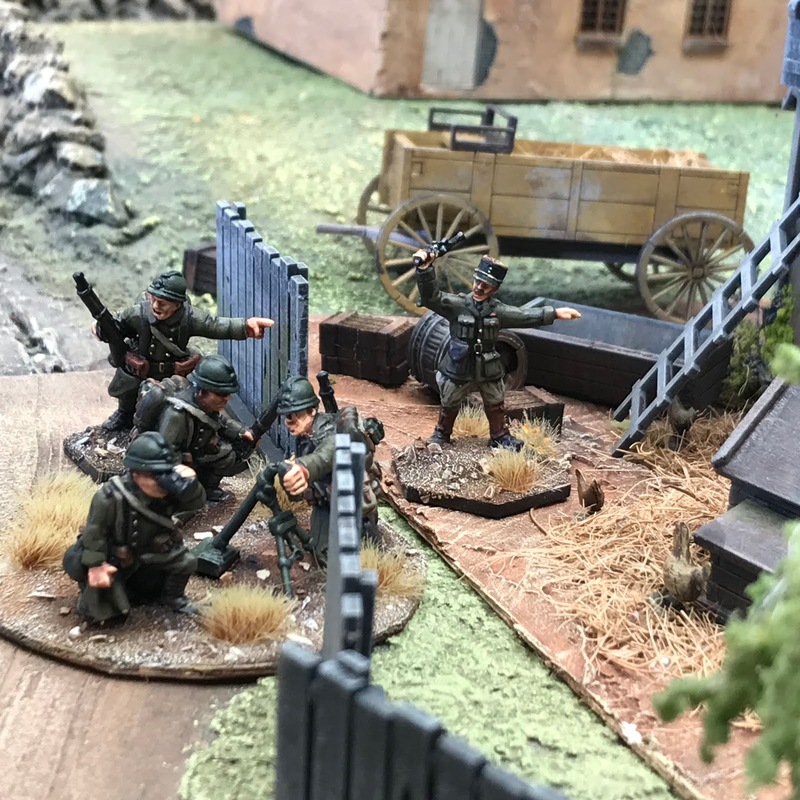 In this first post I'll give some idea of the thought process (sic) behind the game and then I'll give you the scenarios and how the game played out...oh, and there will be a few pics. Mark Freeth was very keen to get an early war 1940 scenario together, initially we toyed with the idea of running a weekend with 2 games running side by side, one containing French and the other BEF taking on the invading Germans. While this was certainly achievable, it involved a few more logistical headaches concerning turning the games around, plus simply having to focus on 2 games at once rather than one. So, in the end we plumped for a single set of scenarios with just the French and Germans. A small problem with running Big CoC games is that the scenarios are somewhat dependant on the number of players attending, and given the nature of the WHC the numbers can vary, Some players book months in advance, but often people will book relatively late so the scenario needed to be capable of being tweaked to fit this in. 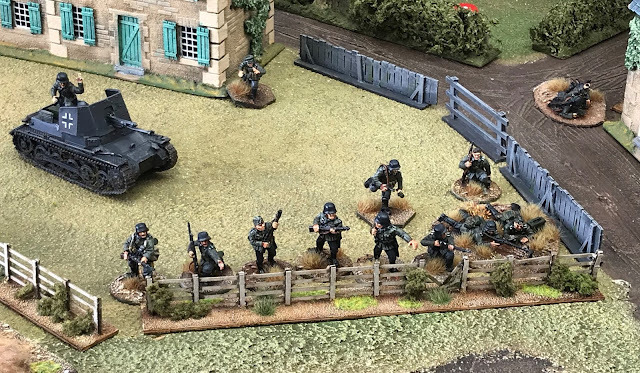 The nuts and bolts of the game don't alter that much, the idea being that each player will command an infantry (or armour) platoon, then the force as a whole has a degree of support which is then dished out. On the whole this is not a problem, but for quite a while we were looking at having six players (fine, 3 on 3) then suddenly the numbers went up to seven. My initial reaction was one of mild horror because it meant balancing the game for a three versus four. However, when I started looking at the way the Stonne game might play out, the imbalance of 3 platoons against 4 became more and more attractive. Looking at the platoon lists for CoC the 1940 German infantry platoons are enormous. Each platoon contains 2 senior leaders and a 50mm mortar team plus 4 x 10 man sections, for a total of 44 men. The French platoons are a similar size, with 2 platoon leaders (1 senior, 1 junior) a VB rifle grenade team of a junior leader with 4 men. plus 3 sections of 11 for a total of 40 men. So if we had seven players, with 3 on the German side and 4 for the French it wouldn't be too bad. 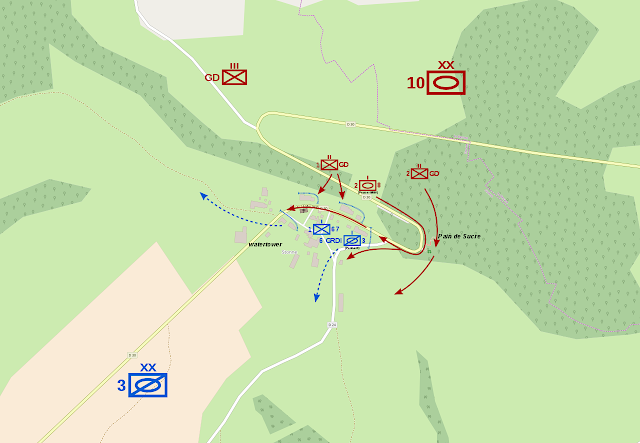 1 player a side would be playing a tank platoon anyway, so it would be 2 German infantry platoons against 3 French, however that is actually 8 German sections opposed to 9 French, making it less unbalanced than first appears. A little extra tweaking by making the Germans "superior regulars" meaning they treat rolls on their command dice of a single six also as a 5, giving them more CoC dice pips during the game, plus increasing the size of their panzer II platoon to a whopping 5 vehicles would compensate for the additional French numbers. Additionally, each German platoon would start with a full Chain of Command Dice. So I worked on that basis, and prepared everything with 7 players in mind, Then of course Mark called and said " I've got an 8th player"......So the superior regular, and the extra CoC dice went out of the window, and the Panzer platoon was cut from 5 down to 4, and the Germans went up to 3 infantry platoons to make it 4 a side. Also the Germans would not have a significant advantage in support points when they were attacking, while the french would. Even after this we had another couple of guys wanting to sign up, but at that late stage we sadly had to say no, and stick with 8, as I think a single game with 5 a side is really stretching it for this rule set - not saying its not possible, but I think the game might suffer. So that is the format we ended up going with, having said that I'm pretty sure the scenarios will work fine with seven (or 5 for that matter) players if the Germans are bumped up a bit to cater for uneven forces. The other aspect of the games that numbers have an impact on is the size of the table used for each scenario. The recommendation for Big CoC is that the table size should be the same as for normal CoC (6' x 4') with an additional foot width per additional infantry platoon added - you add nothing for the armour. Well, The main table at the WHC is 24' long by 6' deep, and so we already play on a depth of 6' which I prefer over 4'. The patrol phase gets forces into action quickly enough anyway, and having the extra depth gives players a bit more room without slowing things down. 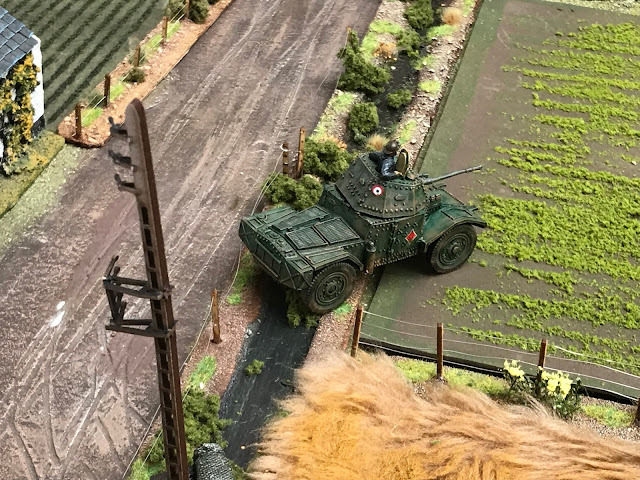 Just adding 2 feet per platoon gives us a width of 8' x 6 " which is fine, but the centres' terrain boards are 3' each so it is convenient to go for a slightly larger width of 9'. a bit more room both on the table and for player comfort. That meant that it wasn't too tricky to divide up the table into 3 sections - 9' at each end and then utilise the central 6' and 3' of one of the other sections to give us 3 x 6' x 9' areas. 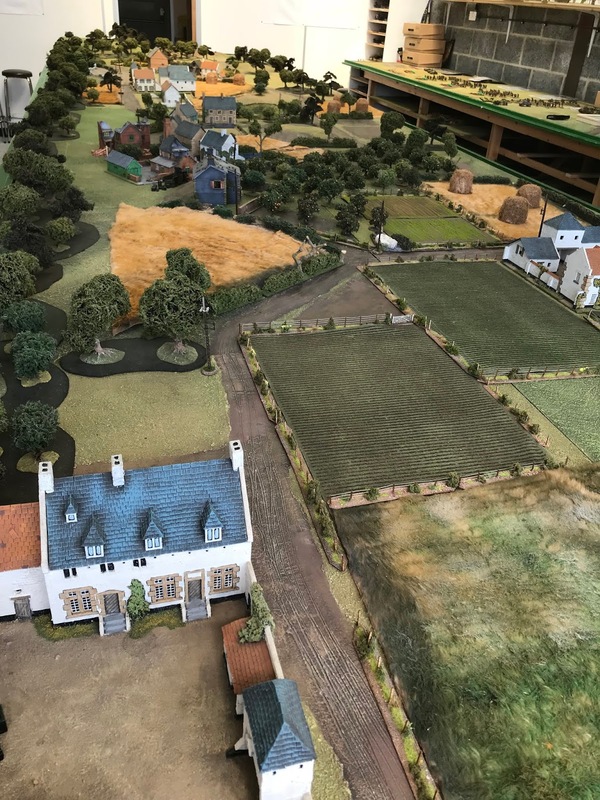 The point of all this meant I could set up the entire table beforehand, and players go from game to game with no great interruptions in order to maximise playing time. Also I think it looks good! Stonne from west to east: Game 1 at the far end, game 2 in the foreground, game 3 in the centre. The Germans are advancing from the north, the French, the south. I also planned to have a 4th scenario, which would have meant re-setting the terrain at one end of the table- it would have been that which was fought over in game 2 so we could do it while game 3 was in progress giving plenty of time. As it turned out, we didn't get in 4 games over the weekend, a bit of a shame but, sometimes CoC games can be like that, some go faster than others. Given the nature of playing 3 or possibly 4 games over a weekend in a campaign format with 8 CoC novices I thought that the first scenario should probably be a bit gentle in order to ease them into it, and allow them to possibly make a few mistakes without getting horribly punished. I also wanted to keep it relatively simple. Given the nature of the fighting in Stonne (the village apparently changed hands 17 times in 3 days), it lent itself to a relatively straightforward narrative: i.e. Attack and counterattack- So I decided to make the first game an attack/defence scenario with the Germans on the offensive at the eastern end of the table, the second game was to be another attack/defence with the French on the offensive at the western end of the table. 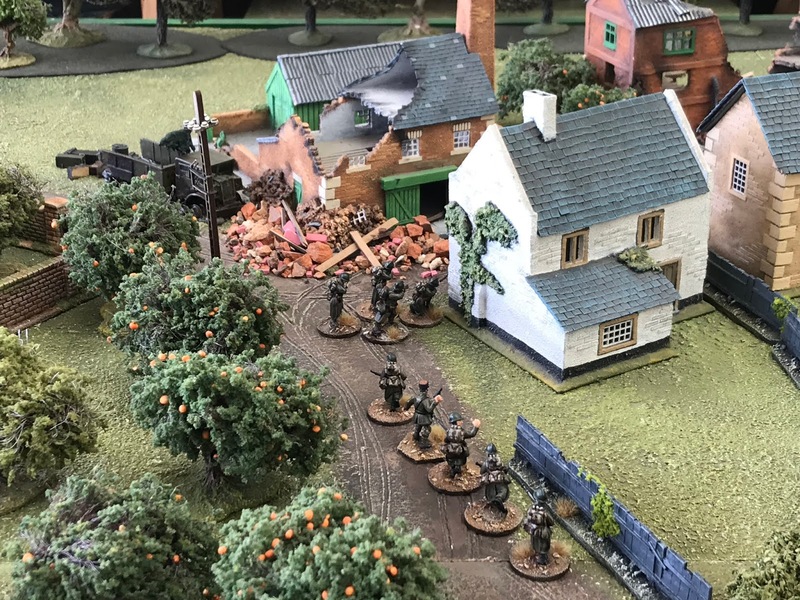 Game 3 was to be in the central area of the table with the Germans attacking in an "attack on an objective" scenario. I planned a 4th scenario which was to be played out on new terrain to the east of Stonne and that would have been the French conducting a flank attack. However, time sadly ran out. I'm sure we will do it one day. 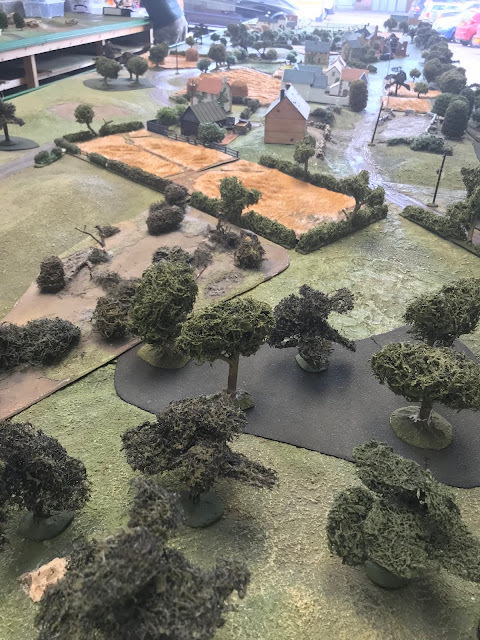 8 players, hopefully 4 games, Germans versus French at Stonne, one of the iconic battles of the campaign. What were the salient features of the battle? The Germans had crossed the Meuse a couple of days earlier and were trying to exploit that relatively fragile bridgehead, the French had rapidly managed to assemble a counter attack force. The massif of which Stonne is a small part doesn't readily show up on a map, but have a look at Google Earth and you can see just how important it was for both sides. The village itself is rather innocuous, just a farming village with two roads entering from the south, however, it is the terrain to the north which both sides were focused on. There is a single road which leads out of Stonne to the north, this snakes down the hillside along a steep wooded slope before reaching the more gentle plain. The entire northern side of Stonne is covered in thick fir trees which extend down the steep slope- there is nowhere in the village itself (other than the "Butte de Stonne") which has a view to the north. However, if you hold the town and can establish OP's in this wooded hillside you have a magnificent vista stretching out 4 or 5 kilometres and more to the north, the German bridgeheads, and the routes they will take as they expand. Subsequently this tiny Ardennes village became vitally important.